In this video I’ll show you how to setup the Mix Monitor to select which microphone channels you want to route to your camera. The ReZoom H5 will record the XLR professional microphones onto separate mono tracks, record the L/R stereo microphones onto another track and send only mics 1 and 2 to the camera. Many other recorders could be setup in a similar way. Link to equipment: https://www.amazon.com/shop/simpleaudiotips as well as some other gear I use or recommend. In this video I’ll show you how a Zoom handy recorder can be used just like a Beachtek or a Saramonic audio interface to connect professional microphones to your camera. The new RODE VideoMic Pro Plus has some really cool upgrades. The mic is fitted to both a Canon 80D and also a Sony RX10 and in this video I look at the new features but consider closely some of the issues raised by recent reviewers. This shotgun mic is setup on a boom for a lot of the dialogue and setup on the camera as you would use in the field. Hear for yourself how the Rode Newsshooter kit performs against our 5 point checklist using two dynamic, a condenser, a shotgun and a lavalier microphone. We examine the features, build quality, audio quality, ease of use and value for money. Limited to one audio input on your camera? In this video I’ll show you how to connect an XLR microphone to your camera by making a simple lead that will create two separate channels. With this lead you can connect another microphone to give you the option of a backup mic or second microphone for interviews. Many video recording apps like Acapella don’t have the ability to adjust the input settings for USB microphones. This video shows you how to break into the input settings on your iPad and adjust the audio input for a perfect recording. Setting up your Zoom recorder as an digital audio interface to improve the quality of your mobile phone recording. Many analogue inputs on mobile phones are quite noisy so using the digital input on the phone and taking advantage of the superior pre-amps on the latest Zoom recorders gives you an abundance of options to connect microphones. 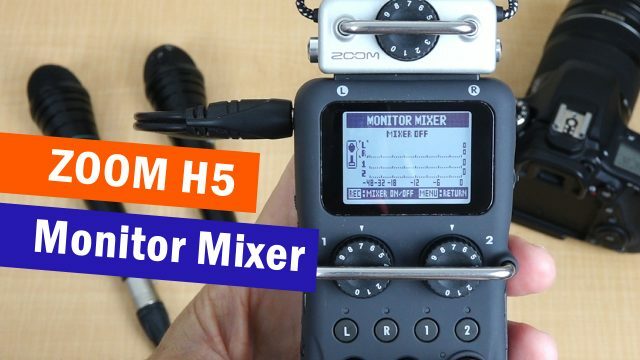 The Zoom H5 is the upgrade to the very popular Zoom H4n. Check out these 6 reasons why it is proving to be a very handy recorder. You may have some questions about taking advantage of the many features of the H5, please leave them in the comments section.